From the smell of the bubbling fruit to the pleasure of spooning the liquid into gleaming, clean jars, there is something very satisfactory about making your own sugar free jam. Perhaps it’s the sense of really creating your own product or perhaps it’s the idea that you are storing good, wholesome food away, ready to be consumed well into the future. Traditionally, jam is made with high quantities of sugar. This not only helps the cooking process but also serves to preserve and make it a long life product. Sugar free jam can be made as a great alternative, however, and if recipes are followed carefully will be just as delicious as more standard varieties. In terms of storage, however, you might find it does not keep quite as long. 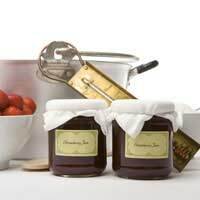 To maximise the time it will last, ensure you have cleaned and sterilised your jam jars thoroughly before use and that they really are air tight and their lids are sealed properly. Fruit juice is a great sweetener in jam but you may need to add a little ready made pectin to help the liquid set. Pectin is an ingredient that is naturally found in fruits (particularly orange or lemon peel). It acts as a gelling agent and is present in special jam making sugar. Added pectin isn’t always essential, however, when making jam. Some fruits, such as apples, blackcurrants, plums and gooseberries are naturally high in it. The more pectin there is in a fruit, the higher the sugar required. Therefore, for no or low sugar jam, it’s probably best to start with a lower pectin fruit, such as strawberry or blackberry. This is a delicious English country recipe with a wonderful fruity flavour. Add liquid pectin to help it set well. Wash your fruit thoroughly and remove any leafs or bits of stalk. Core and peel your apples. Place in large pan with your water, lemon rind and juice, and apple juice. Bring to the boil and simmer for about three-quarters of an hour, scrapping off the scum from time to time. Also stir once in a while to prevent it from sticking. Add liquid pectin then boil for a minute or two. Remove from the heat. Pour into clean jam jars and leave to cool and set. Some ready-made sugar replacement products, such as both natural and artificial sweeteners, can be used when making sugar free jam. It is essential to read the manufacturer’s instructions first, however. For natural powdered sugar replacement products try your local health food store.If suitable, simply use the sweetener instead of sugar. Some recipes, however, also call for added gelatin or pectin to ensure setting occurs. Here’s a simple recipe for strawberry jam with sweetener. Rinse your strawberries and remove any pieces of leaf or stalk. Place in large pan with your water, lemon rind and juice. Bring to the boil and simmer for 15 minutes, scrapping off the scum from time to time. Also stir once in a while to prevent it from sticking. Stir in your sweetener until dissolved. Dissolve your gelatin in a tbs or two of cold water. Stir into the hot mixture. Remove from the heat. Pour into clean jam jars and leave to cool and set.